Today, we are proud to present to you – LeadsLeap 3.0. Many things have been changed. I will highlight the important changes. To keep things more organized, we’ve re-organized the navigation links. 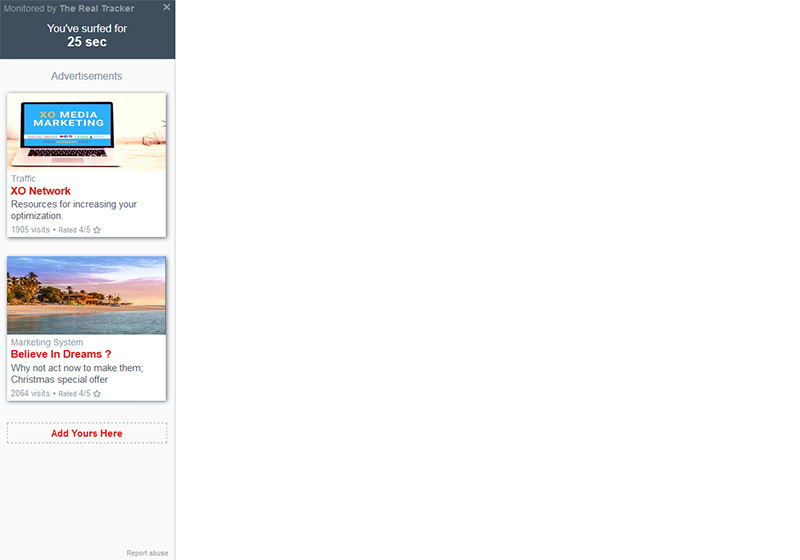 We’ve also made the navigation panel scrollable independently and intuitively auto-scroll the current link to the middle. Say if you are managing your link trackers, there is no need to keep on scrolling to toggle among links, ad bar and rotator. Just try navigating. I’m sure you’ll find it more user-friendly than before. Some terminologies have been changed. Reason: Daily & weekly earnings sounds confusing. Earnings are now named after the “purpose”. Reason: Upline & downline are terms associated with MLM or Matrix program. Since we are not MLM nor Matrix, we should use other terms to avoid misunderstanding. The old Downline Message has an ad-looking format. The new (renamed) Follower Message is dialogue-looking. Our aim is to make Follower Message more personal. It is the way to build a long-term relationship with your followers. There is a panel at the left showing the ad that was clicked. It serves as a reminder for the visitors, so that they know what to look for when they surf the page. The links to rate the ad and report problem ads are also found in the same panel. Note: In LeadsLeap 3.0, members will earn 1 credit when they report problem ads. The credit is added upon verification. If it is a false alarm, no credit will be added. Some ad issues may be temporary. If you’ve reported an ad but the issue has already been resolved when we review the report, it will be considered a false alarm. No credit will be awarded in such case. Why don’t we just reward any ad report? Because if we do so, there will be people who report any and every ad! How do you know if you’re credited? In the new Ad Viewer, you will know that you’ve started earning credit when you see ‘Surfing in progress‘. If there are issues with the ad you’re viewing, you will see the issue instead of ‘Surfing in progress’. This gives you better clarity on whether you are being credited. Some issues you may see include ‘You are revisiting this link‘, ‘Avoid clicking ads after ads‘, ‘Your account has been flagged‘, ‘Unusual activity detected‘. How to view more ads? To view more ads, you can click either ‘Show More Links’ or ‘Show More Links In The Same Category’. Many changes have been made in The Real Tracker. To make your tracked link more professional, we have prepared a dedicated domain for The Real Tracker. You don’t have to do anything. Old tracking links will automatically be redirected to trckapp.com. Just remember to use the new tracker url in your future posting. If you’ve enabled ‘Monetize‘ option in your tracker, you know that ads will be shown and you will make money in our PPC program when people click the ads. In the old system, the ads are served in a popup. It is a little too subtle. 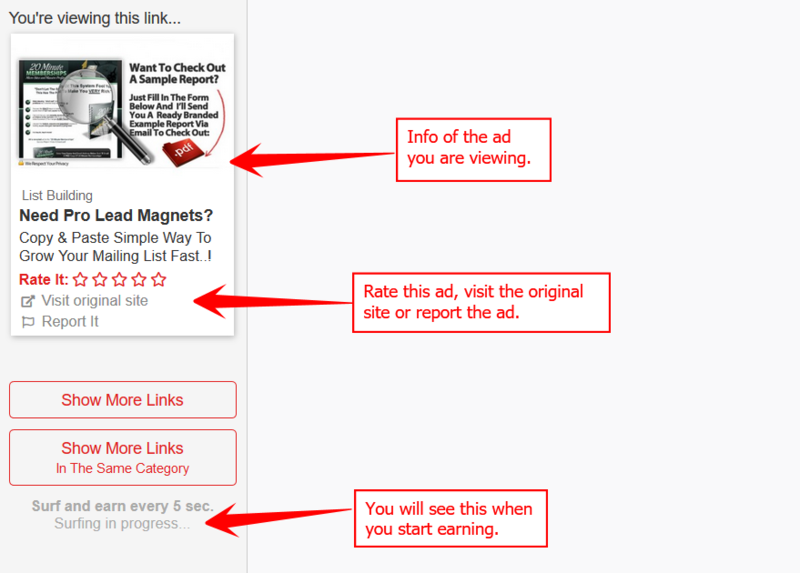 To increase the clickthrough rate and hence your PPC earnings, we’ve redesigned the ad format. Ads will now be served according to the orientation of the browser. 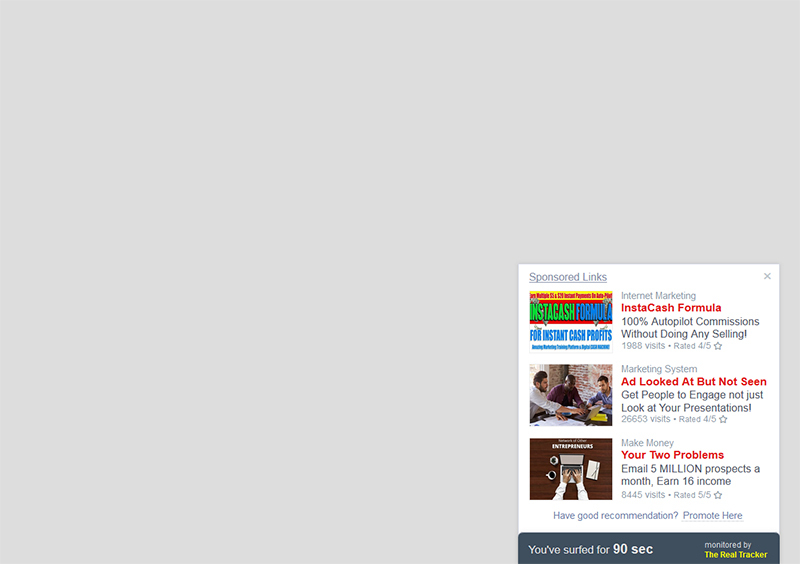 If the browser is landscape, ads will be shown in a left bar. If the browser is portrait, ads will be shown in a footer bar. 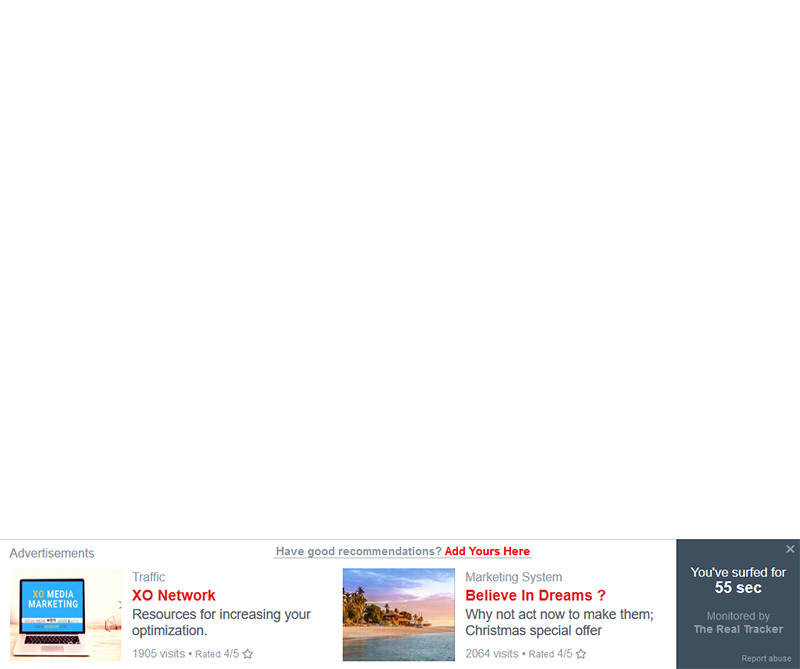 The idea is to minimize the blocking of your content by showing ads in the ‘extra’ space of the browser. We will monitor the clickthrough rate of this new format. If it is good, we will keep it. If it is bad, we will ditch it. I’ll keep you updated. Update: To our surprise, the new ad format hasn’t resulted in significant increase in click-through. Since that is the case, we have reverted back to the subtle method of showing the ads in a small popup, so that your visitors will have full attention on your link. Below is how it looks like now. The ad will not be shown immediately. You can decide when you want the ad to show, say 20 seconds or 45 seconds after page load. You can also decide whether you want to place the ad at the bottom left or bottom right. For the other changes, I will just list them here for now. But that doesn’t mean they are minor changes. Some of them are powerful features that I will explain further in another blog post. For now, I just want to give you a quick overview. Teaser is now html enabled. You can now add more fanciful teasers. You can now insert popup into your tracker! 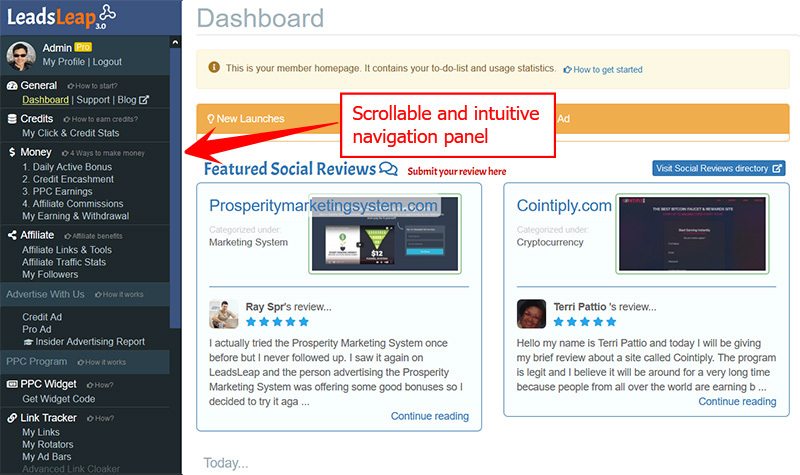 This means you can now build list while promoting affiliate links. If your tracked link has responsive web design, you can turn on ‘Responsive Mode‘, so that your tracked link will look nicer on mobile devices. You have a choice of whether to make the footer ad collapsible. You can now change the color of the Ad Bar. Ad Bar count down timer design has been changed. For link rotator, you can now set a daily and total limit to the rotated links. For now, let’s end the update here because I don’t want to overwhelm you. Take a look at the new system. Let me know what you think. Awesome changes. Thanks Kenneth!!! Looking forward to utilizing some new features. Epic!!! Love the new surfing style. and the associate message section is much Better! Loving the revamp ! great stuff as always thank you! exciting new features please keep em coming, Cheers! Everything’s really great, but if I had to choose which change I like more, then, hands down, is the popup in tracker addon! Yup. That’s a powerful feature. You manage to spot it from the list! I can’t find surf area! It is gone! How do make money without the surf area? Charlotte, the “Surf Ads” page is redundant and has been removed because you can surf ads from almost every page of your Member Area. There is no need to have a dedicated page just to show ads. I love everything but the new surfing experience, full page views are better than an ad with details. The details are already on the site. I often forget what is the ad that I’ve clicked. A repeat of the ad is a reminder. Also, with a good Ad Text, visitors know what to look for on the page. For example, if an ad says ‘Get 100 leads a day’, then when surfing the page, I know that’s what I am looking for. Give it a try. It may seem redundant but practically, that reminder ad is quite useful. I agree kenneth, I think I was just too quick to comment, it’s looking real good. Your system is outstanding. I like the new style, and format makes it much easier. I like it better than the old way. Great job! You will be adding an option for social add on for PRO members? Robert, I have replied you via our support ticket to understand more about this. I love the revamp, it’s not so hard on my wrist to do the ratings and scrolling top to bottom – I am already clicking more. One small suggestion though – could we get a counter to see what we have clicked – instead of jumping back and forth to the dashboard. My website has been on it’s own revamp – today it got lots of LL widgets added to it. Great job! You mean a stat on the left panel showing how many ads you have visited and how many credits you’ve earned today? That’s a great idea! Will add that in soon. I’ve been waiting a long time for the popup generator to be incorporated into the Real Tracker – now it’s finally happened and it’s AWESOME! I used to use the tracker to post links on Twitter to current news stories in my niche and have the Ad Bar at the top, but this was a little too subtle… Now I can send my followers to other people’s blogs for the latest news and views and have my own squeeze form drop right into centre-stage! Priceless! Epic changes to an already awesome TOOL. Hello Kenneth, I like the new look and Features on the Site. LeadsLeap just gets better and better. If there was only one Site I was Upgraded in it would be LeadsLeap because it has so many benefits. Great work Kenneth and the whole LeadsLeap team for such as fantastic upgrade! I’m really looking forward to seeing the massive new growth with these excellent improvements. All the best for now! New format i very good, and easy. I certainly love these changes. I like the face lift especially! great job all. I am interested in this system but I do not know how to use it. I am interested in this system. Great work of changes! I love this new look!!! congratz admin and the whole LeadsLeap team! So great changes to remain live LeadsLeap. Very impressive to NEW comers. New format is very good and easy. I enjoy with your site. Great work of change I love it. Loving the addition of the pop up to the trackers, awesome!. Just one little thing, If you switch off monetisation, the option to position the tab or text seems to have been removed, eg bottom left, right center etc. I have a chat system on my pages that sits in the bottom right, so personally I liked that I could set my tab for the tracker to the other bottom corner. Would it be possible to re-instate this Kenneth? Hm… some good old features have been removed in the new system. Give us some time. We will add it back. Thanks Kenneth, I have a workaround for now, but it would be great to have that function back in place at some point. The new features are really great and I am still having fun figuring out ways to get the most out of them. Thanks for all you do. WOW! What a difference. Viewing 10 sites seemed like a task before. But I actually get hooked on the new ad viewer (I viewed over 100 sites the other day – never done that in LeadsLeap before). The new RealTracker format is awesome, too! Good going, Kenneth. You finally converted me ;) I don’t even log out anymore and LL3 stays permanently open in the first browser tab. 1. leadsleap is great and unique in its own ways. Thanks for your candid review. We will continue to work hard and improve on things we are weak on.